AnchorCert Gem Lab is an independent gemstone laboratory whose grading and testing examinations ascertain the characteristics of a diamond and above all, verifies if a stone is natural. 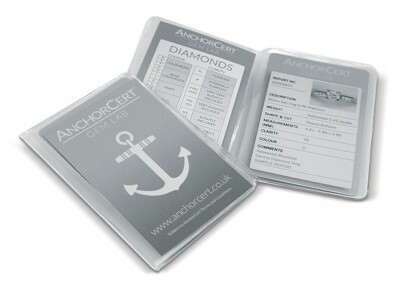 AnchorCert Gem Lab Diamond Reports provide reassurance of the authenticity and quality of a gemstone. An independent diamond certificate adds real value to your diamond. 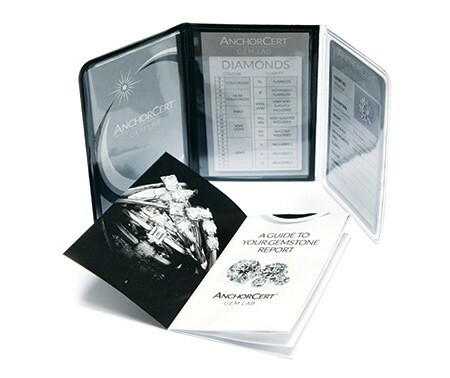 Whether you are a diamond dealer, a jewellery retailer, or a member of the public about to make a significant investment in a piece of jewellery, you can have complete confidence in AnchorCert Gem Lab Diamond Reports. The full diamond report is a comprehensive report suitable for loose (unmounted) coloured and colourless diamonds providing detailed information on all facets of the stone. Details included on the Full report are weight, measurements, colour, clarity, cut grade, symmetry, fluorescence, girdle description and shape. 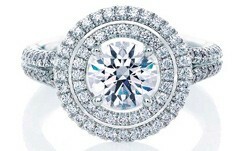 The report also outlines details of facet angles and proportions of the diamond. All inclusions are plotted on the facet diagram thus uniquely identifying the stone. The full Report provides where appropriate the proportion table for fancy cuts. A Full Report without facet diagram and reports for Laboratory Grown Diamonds are also available in A5 format. The Mini Diamond report is a highly popular and competitively priced report suitable for loose and mounted stones and multi set jewellery. It presents the important quality information including weight, shape, cut, measurement and clarity and includes a digital image of the stone. The Mini Max is for those seeking a more contemporary and informative presentation, the Mini Max products adds authority to the Mini Report. Packaged in a protective satin finish wallet it includes full details of the grading system used, a consumer orientated glossy brochure and grading card all presented in a attractive credit card format. The number of treated diamonds identified as such by the AnchorCert Gem Lab at the Assay Office Birmingham significantly increased over Christmas. We asked them to explain the types of treatment, how they are achieved and how they are spotted. The recent buzz around the international gemmological industry recently has been all about lab grown diamonds. Once again illegal parcels have been found with lab-grown diamonds mixed with natural stones, causing angst throughout the industry. This new concern, with lab-grown diamonds being impossible to identify without testing every stone, is just one of several factors challenging the integrity of diamonds at present. There is also huge noise about some diamond certificates which overstate the quality of the stone, thereby cheating the purchaser, and there are various moves in progress to confront this problem and curtail the activities of the rogue certificate providers. However, alongside the latest concerns, the biggest problem remains the centuries old issue of diamonds being treated to enhance the quality and therefore the value of the diamond. Such treatments are perfectly acceptable if they are disclosed, but in many cases there is no such disclosure. The AnchorCert GemLab has rigorous screening and testing procedures which are part of every AnchorCert assessment and authentication. Stones which had been bought in good faith as natural and untreated can be checked for a variety of enhancements, the most common being laser drilling, irradiation, and coating. 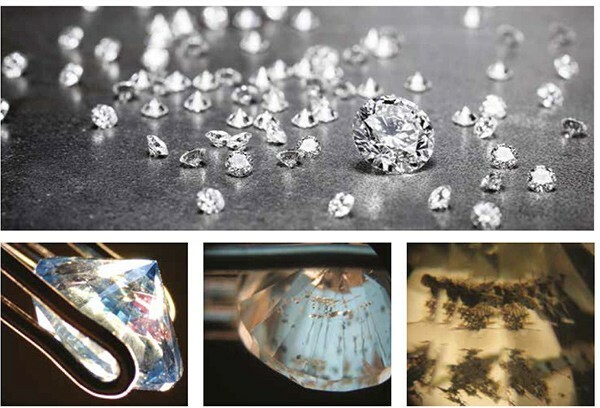 A recent example was a small set of seven diamonds submitted for quality assurance checking to ensure they were of the required standard and six proved to have been subjected to internal laser treatment and laser drilling. Most of the diamonds were less than five points. This can be tricky to detect unless you are experienced in looking at diamonds. In internal laser treatment there is no drill hole or drill channel present but the laser leaves a worm-like squiggle; this treatment is also known as KM treatment. KM stands for ‘Kiduah Meyuhad’ in Hebrew meaning ‘special drill’. This treatment is used on black inclusions which are accompanied by internal fractures. One or more pulses of the laser beam are focused on the inclusion with the resulting heat creating an internal fracture. The inclusion is then bleached by boiling the diamond in strong acid under pressure. The created feather is very difficult to differentiate from the natural feather, but it can be easily spotted under high magnification of a microscope using different lighting techniques by an experienced diamond grader/gemmologist. This is a much more sophisticated process than the original laser drilling used to reduce the visibility of natural inclusions which is far easier to detect with a 10x loupe. 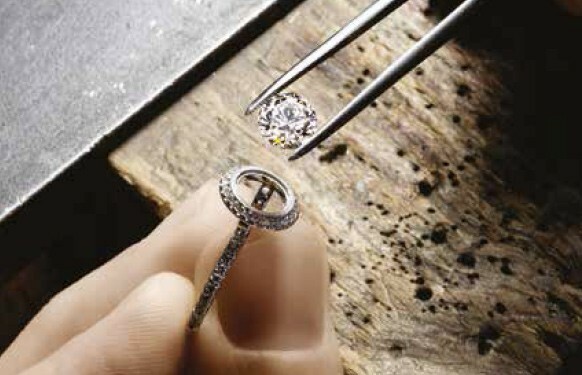 This process involves a hole being drilled through the diamond using a very narrow laser beam to reach the inclusion. Carbon dioxide lasers are used to heat a tiny area of the diamond until it evaporates, forming a tube reaching the inclusion. The inclusion is then vaporised with laser, bleached or etched with acids. The inclusion becomes less apparent, makes the diamond more saleable but it is still present. Other nasty surprises for our customers can be irradiated stones. 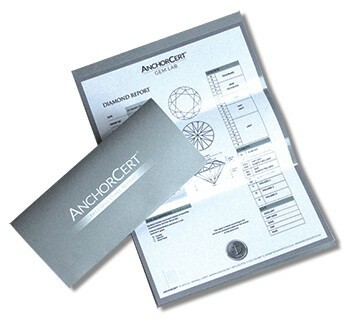 AnchorCert Gem Lab has seen a number of coloured diamonds of a carat or more - and therefore potentially high value - which have been irradiated to improve their colour. This is a stable treatment under normal situations and so the stone will remain as it was when purchased. Again the practice is acceptable, but must be declared. Radiation from high energy particles is used in creating colour centres in diamonds. These radiations alter or damage the crystal structure and change or intensify colour. The most common colours caused by irradiation are different hues of blue and green. Heating (annealing) the diamond after bombarding it with charged particles results in the modification of the bluish green colors to yellows, oranges and sometimes pinks, reds and purples. Depending on the type of radiation used the colour may be restricted to the surface or penetrate the whole stone. The treatment can only be detected by testing the absorption spectrum using UV-Vis Spectrophotometer and Photoluminescence using Raman spectroscope under liquid nitrogen temperature. The third type of treatment to create a stir is surface coating. Surface coating treatment applies a thin layer of coloured foreign material to all or part of a diamond surface, to either mask the underlying body colour or enhance a desirable colour. Most often, this coating is applied to the pavilion and/or girdle of the diamond; the way that light refracts as it passes through a diamond then creates the illusion of uniform colour distribution. The durability of diamond coatings varies considerably depending on materials used and methods of coating applied. Most recent advances in technology employ a very thin optical or chemical film which is more durable than older methods, but still readily worn away by heat, scratching, abrasion, polishing, and just everyday wear. The coating, if at all damaged, can be picked up under microscope by an experienced diamond grader/gemmologist. There are many other treatments for natural gemstones that those in the supply chain need to look out for. Fracture filling and HPHT treatment are the most common and AnchorCert gemmologists see these regularly. However the number of stones subjected to these three sophisticated processes (internal laser drilling, irradiation and coatings) is on the increase. All three range from hard to impossible to detect without the appropriate expertise and equipment. The fact that there are gem testing facilities out there operating without the kit necessary to spot these treatments is a major concern as they cannot possibly be picking them up. There would appear to be a lot of gemstones out there which are not what they purport to be. The industry needs to continue careful due diligence procedures to protect itself. AnchorCert Gem Lab has a fully equipped diamond, gemstone and pearl grading laboratory located within the Assay Office Birmingham building. The industry leading state-of-the-art gemmological instruments range from the tried and tested 10 x diamond magnification lens to the sophisticated Raman spectrometer. Continuing technological investment keeps the laboratory at the forefront of diamond, gemstone and pearl grading in the UK. All stones sent to AnchorCert Gem Lab are screened to ensure they are natural. The Laboratory is able to detect and identify synthetic diamonds and HPHT treated stones as well as enhancements ranging from laser drilling and fracture filled stones to colour treated diamonds. AnchorCert diamond graders are all highly qualified and motivated, and maintain their expertise by undertaking continual professional development through a range of recognised formal and practical training courses.